September is another of my favourite month, besides the term break after the hectic mid year exam there is Mid Autumn festival~ where I can feast on moon cakes YUM! That and also looking at the colorful lanterns of vibrant colors and various shapes & sizes. I love the traditional lanterns made from glass paper as they hold a special place in my heart. When I was a little girl, I was taken care by my grandparents, on every mid autumn festival my grandfather will buy 1 or 2 such lanterns for me. As years goes by my collection grew, I remembered there was a phoenix, a dragon, a goldfish, a rabbit among them. It was such a pretty sight when I lite them all up on the mid autumn day, while munching on the mooncakes. These days I don't buy lanterns for DinoBoy as he does not appreciates them plus he only like those plastic inflatable lanterns with super duper noisy music that will create a ruckus in the house or anywhere! 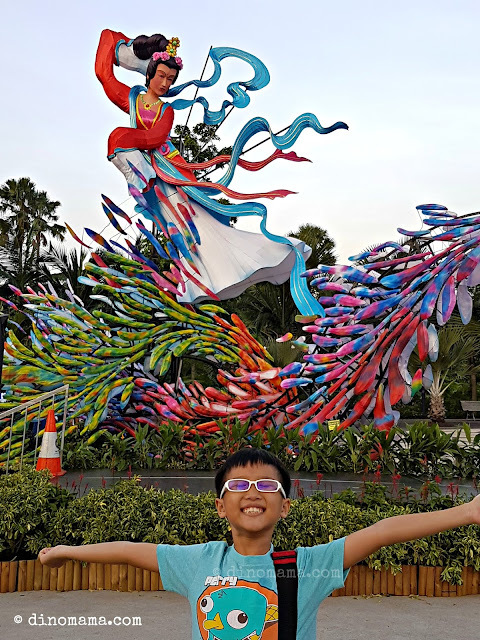 However, when I told him that we will be seeing some giant lanterns at Gardens by the Bay's Mid Autumn Festival, he was all hyped up and eager to see them. We visited the festival a day before the official launch and here's what we did and saw. Look at him smiling so happily in front of Chang'Er or 嫦娥, one of the giant lantern sets you will find all around the garden. 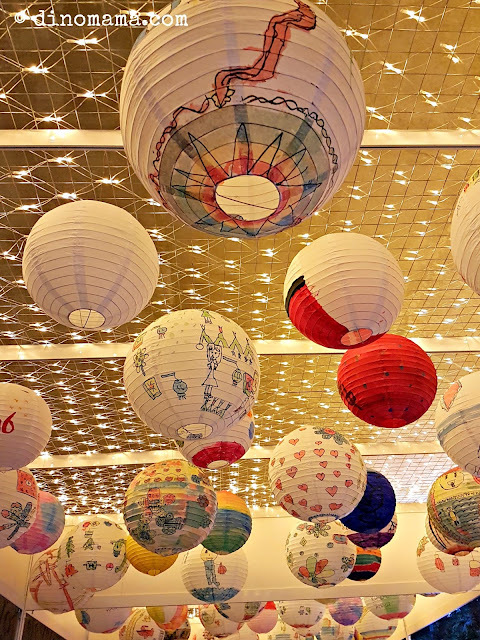 These giant lantern sets are based on stories of the moon in Asian folklore. 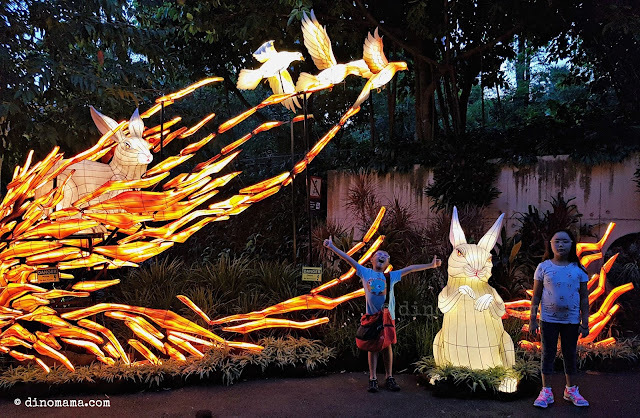 These magnificent lanterns with their vibrant colors looks pretty during day and night, some of the sets have elements that stretch across several parts of the gardens. Do look out for the storyboard that accompanies the lantern sets, they tell the story of the folklore in case you are not familiar with them. And indeed, the Colonnade of Light led us to food and beverages! 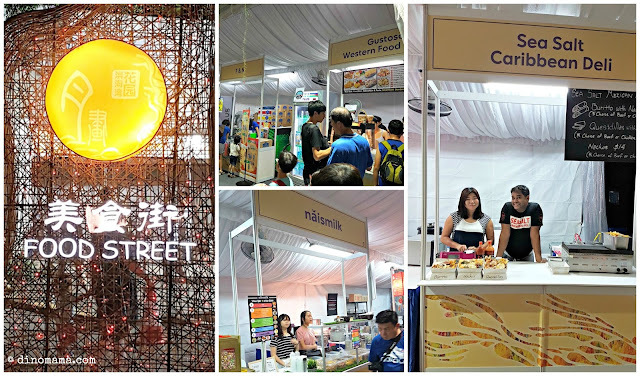 Yes, there is Food Street to quench your thirst and satisfy your hunger, click here to check out some of the vendors that you may find over there. 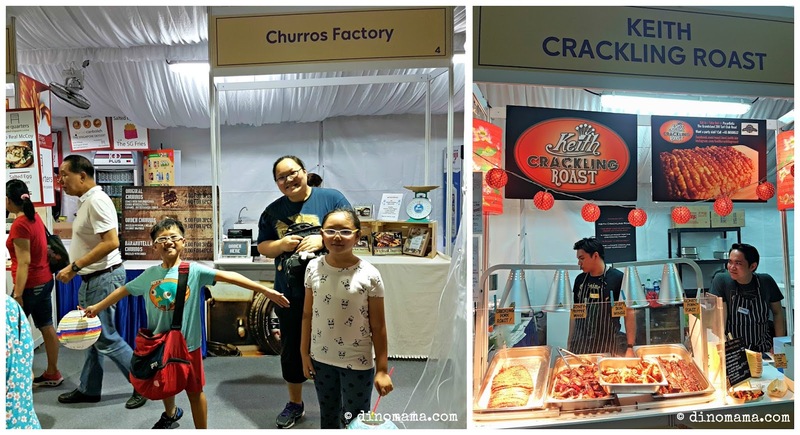 For the meat lovers, you really have to check out the crackling roast pork over at Keith Crackling Roast. That slab of roast pork looks so inviting and so delicious! 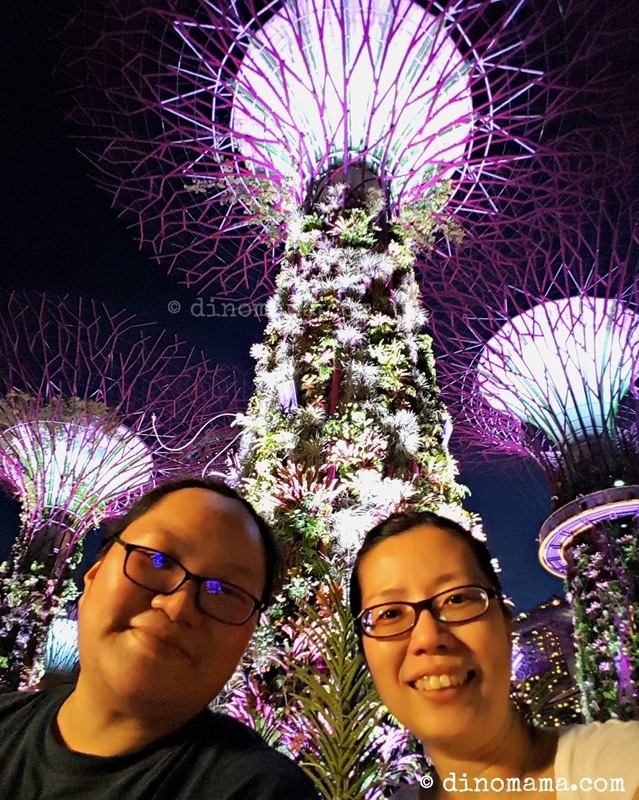 It was a warm and humid night, even though we are hungry, we did not feel like having such dry, fried food, not even the sugary canned drinks by a local famous brand is able to make us want to grab a can of icy cold drink to cool ourselves down. We walked up and down the street twice, about to give up on the hope of getting anything to eat and drink when something caught our eyes, 3 big glass containers of lemonade! We made a bee line to it and was greet by the friendly lady mending the Sofnade stall. 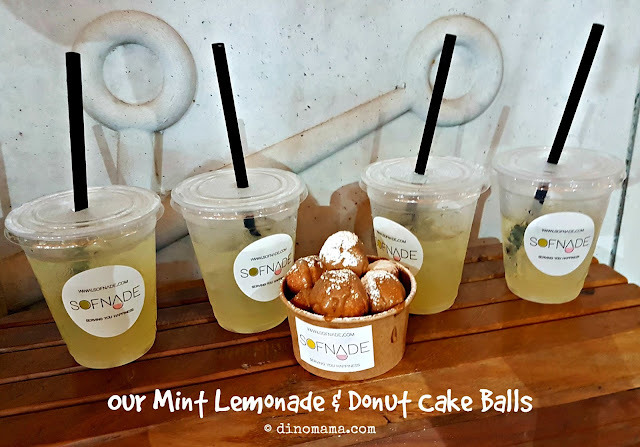 We each grabbed a cup of freshly squeezed, chilled mint lemonade, as we feel the lemonade flows down our throat we felt the cooling sensation going through our body. Yes, that night was ultra warm and humid. 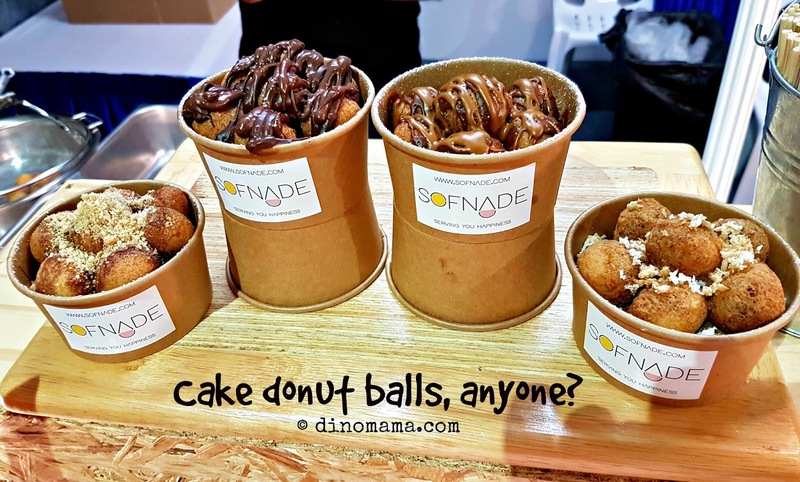 We decided to try their cake donut balls even though its fried but its bite size finger food (so mess is allowed thus the kiddos won't get chided off for being messy), pop into the mouth and chew. It was a wise decision because the cake donut balls was soft and springy, full of cinnamon on every ball! If you watch the video below you will see that the Handsome Man squeeze the cinnamon sauce on every layer, not stingy on ingredients! Plus point for them! Don't forget about the signature light and sound show of the Gardens by the Bay while you are there~ The theme for this festival is "A Journey Through Asia", be prepared to sing along famous tunes such as 《夜来香》, 《甜蜜蜜》，'Bengawan Solo', 'Dayung Sampan', 'Sukiyaki', and 'Singapura, Oh Singapura' while you immerse yourself in the rich and diverse soundscapes. 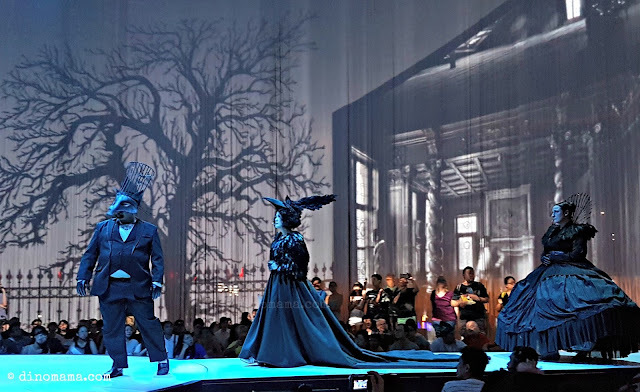 The overall creative vision is led by award-winning Lighting Designer Adrian Tan, and one of Singapore's most sought-after music composer and arranger, Bang Wenfu, since 2015. Guest Lighting Designer for this edition is Taiwan-based Goh Boon Ann, formerly the Resident Lighting Designer of City Contemporary Dance Company and Guangdong Modern Dance Company. When we were looking for this event we strolled unknowingly into almost total darkness at the Meadows, we thought we have made a wrong turn but there were others walking/strolling around, we ventured further and saw this huge structure standing somewhat eerily in the middle of the field. The shadows of the crowd added to the mystery and suspense too. As I walk towards to structure, I was stumbling coz it was dark and there were no lights, but mostly coz my eyes were glued to the images on the structure, trying to make sense of what was being shown on it. 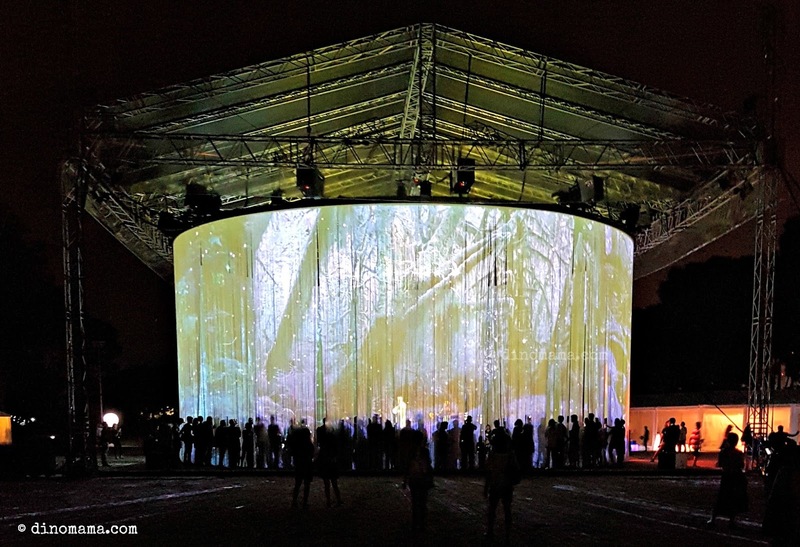 When I entered it I was awed, mesmerized by the images projected on the "wall" and trying to take in every thing. This magnificent structure is Ron Arad's 720°, in its perfect circle that measures 18m in diameter, it's "wall" that is made up of 5,600 silicon cords; that's over 37 km in length and suspended from a height of 8m. Ok so a full circle is 360°, why is this called "720°"? This is because these silicon cords serve as an interactive video screen for both sides of the 360° stage, so its 720° in total. The man who created 720° is Ron Arad, one of today’s most influential architects, artists and designers with a fearless approach to form, structure, technology and materials. His public art pieces include the “Vortext” in Seoul and the “Kesher Sculpture” at Tel Aviv University. Major retrospectives of his work were mounted at the Barbican Art Gallery in London (2010), MoMA in New York (2009) and the Pompidou Centre in Paris (2008). 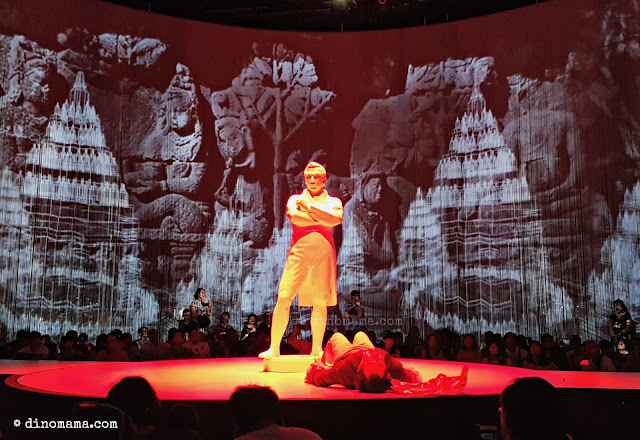 While I enjoyed the 30mins performance it was definitely not suitable for young kids even though there were scenes that were light-hearted, cheerful and colorful. 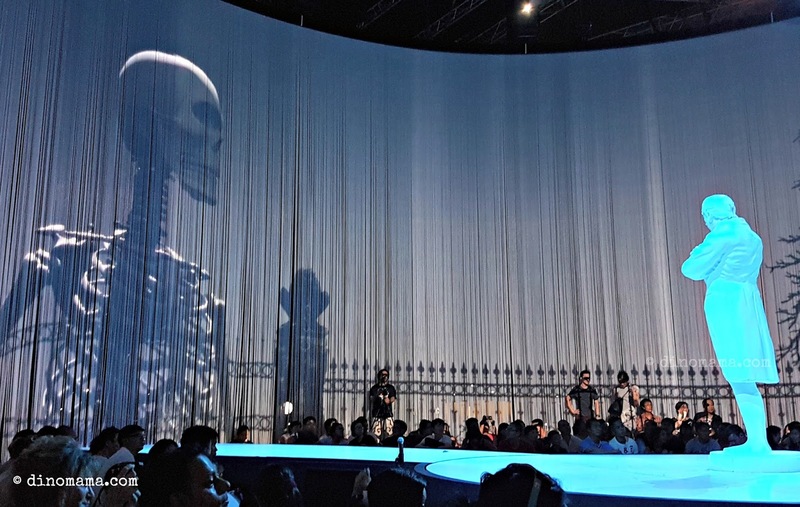 However, most of it were of dark solemness atmosphere, the sadness, death, mourning, pain... the giant skeleton projected on the wall sent a handful kids crying or dashing out through the curtain in fear. Apparently there are a few performances throughout the day, do check them out before heading down with the little ones. Going out with two 10 year old and 1 Pokemon trainer it is quite difficult to visit all the programs of the festival. Ok I digress, YES! you can catch Pokemon in the garden too and judging from the numerous time I lost that particular adult with the 2 kids stuck to her, apparently there are MANY pokemons to catch. 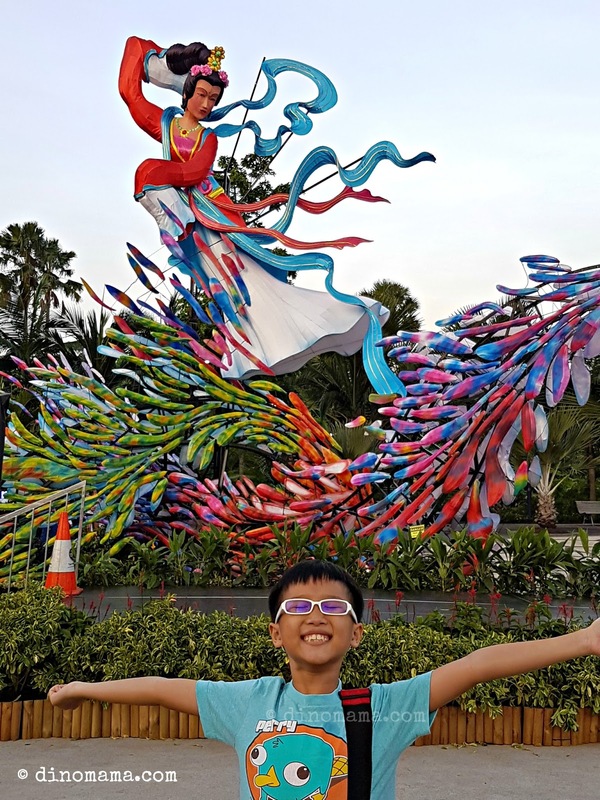 Back to the main topic, besides the above programs do check out other activities such as cultural performances by various traditional art groups, crafts for the young and old, story telling for the kids too. Its Mid Autumn tomorrow, why not head down to Gardens by the Bay to immerse yourself with spectacular sights and sounds of the Mid Autumn Festival? Bring a mat, you don't need to prepare food as you can just grab some from the food street, sit down on the grass and enjoy the beautiful moon which is said to be in its biggest and roundest on this day. Perhaps you can see Jade Rabbit and Chang'Er in the big round moon.